Apple's new Macbook laptops include a Touch Bar that replaces the function keys at the top of the keyboard. You can program these keys with your own custom functions. I was curious to see what the documentation for the Touch Bar looked like. In looking at the Apple docs, the most interesting element is the image sizes -- the original image sizes are 4 times the size of the shown graphic. This technique helps create a sharp, crisp look to text when the large image is constrained to a smaller size in the browser. However, if you're translating your content, text callouts can be problematic. 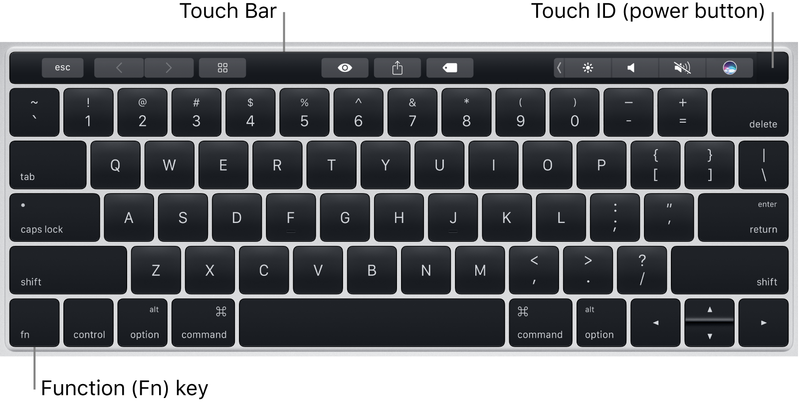 You can check out the Touch Bar documentation here: Meet the Touch Bar and Touch ID. In particular, take a look at the first graphic (the keyboard with callouts). In the browser, this image is about 400px. However, if you right-click and open the image in a new tab, you see that the full size is much larger, about 1600px. Why the difference? When you start with a large image and constrain its size down in the browser (by adding a max-width attribute to the image tag), the resolution looks a lot more crisp on a high retina display than a regular display. That’s because the high retina display allows you to pack more pixels per inch. You won’t really see the difference on a regular monitor, but for fun, I embedded two graphics for comparison below. The first is the graphic at 400px width, while the second is 1600px wide. On a regularly 72 DPI monitor, you won’t see much difference between the two. But if you view the same images on a high retina display, which packs in a lot more pixels per inch, the text looks a lot sharper in the second image (with the 1600px original size). If you aren’t sure how many pixels per inch your monitor has, look at dpilove. My Macbook Pro has 227 pixels per inch, but my Dell monitors have only 166 pixels per inch. When I take screenshots, it’s best to take them from the high retina display using Snagit, because Snagit gives me the option to save my screenshot using the pixels captured from the high retina monitor. To take clarity one step further, you could use vector diagrams instead of rasters (for your images with text callouts). Vectors use mathematical algorithms instead of pixels, so the display resizes to fill the width of its container, keeping the sharp, clear edges for your text. With vector graphics, make sure the graphics display properly across browsers. Beyond checking Chrome, Firefox, Safari, Edge, IE 11, and your mobile or tablet devices at hand, you can also use services like Browserstack.com to increase your tests. I recommend this style hack for targeting older IE browsers, which are problematic with vectors. Although my tests with Browserstack did reveal some gaps in browser support, I’m not too worried. If developers are still using IE 8, they’re not my target audience anyway. I tried to find some Apple documentation in Japanese to see if they also translated the text callouts or if they used the legend approach. Although I couldn’t find the Touch Bar docs, I did find this pdf, which suggests that they do translate the text callouts. Still, the limited space available in text callouts makes them less readable. You end up giving items just a name rather than providing both a name and some explanatory detail. Bright accent colors such as red, orange, or magenta are often used for the callout liness – these colors usually stand out against the main background of a user interface. Apple’s choice of gray for callout lines makes the lines a bit quieter, but this color will become problematic when the UI consists of gray tones. Lines that cut across the image often need a white stroke to stay visible. When it comes time to translate the image, if the text is stored in the image file itself, you’ll have to either extract the text into a standalone file or send the image file to the translator with some kind of denotation about which callout will refer to which translated name. Additionally, when you get the file back, you’ll have to re-align all of the text because no doubt the translated text will require adjustments with alignment and spacing. Overall, putting text in callouts greatly increases the difficulty of translation. For all of these reasons, it’s just best to use the legend approach with callouts when you’re translating your content.